They say that a picture is worth a thousand words. True enough. Maine takes this thought even further. This eye-popping state with its dynamic coastline, acres of forests and endless lakes and rivers is worth a thousand pictures, and more. Companies such as Mainely Photos and Katahdin Photo Tours offer photo safaris into Baxter State Park and the surrounding wilderness in search of moose, bear, birds and stunning landscapes. Autumn turns the leaves red, orange and gold making your photos even more impressive. Other outfits such as Maine Quest Adventures combine back-country kayak and canoe trips with your photo adventure, led by Registered Maine Guides. 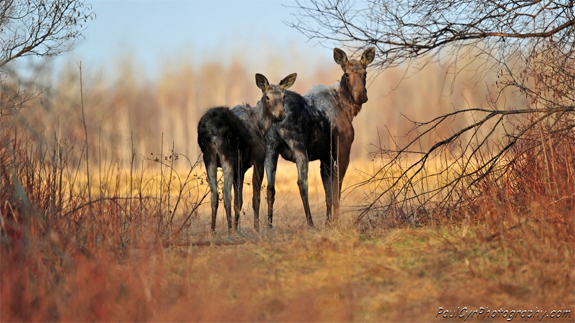 Sample prices include a land based Moose Tour by van at $49 per person, with optional children’s rates. Guided canoe or kayak trips including wilderness camping, average $300 per person for a two day trip up to $800 per person for a seven day adventure. Another way to get some stunning photos is to take to the air. Scenic Flights of Acadia offer single-engine plane adventures over Acadia National Park and along the coast in search of lighthouses and wildlife. Prices range from roughly $46 per person to $188 per person, depending on the length of the flight. Hot Fun Balloons, based in Portland, offers a more leisurely ride in the sky and even more photo ops. The three-hour experience, including inflating the balloon and a champagne toast at the end, runs about $300 per person. Sometimes the most memorable photos are taken from the deck of a sailing ship. Maine Windjammer Cruises gives you the opportunity to catch a whale or dolphin in your lens or the perfect viewpoint for a Maine sunset. Then again, you could opt for a cruise on a working lobster boat and learn how to catch these creatures of the ocean deep. Maybe one of your photo ops will be of you holding, carefully, your first live Maine lobster. Each of Maine’s eight regions has its own charm. Our Aroostook County Photo Gallery offers aerial views of a lightly populated landscape blanketed in winter snows and blessed with the reds and golds of a Maine autumn. The patchwork of crop rich farms and the winding fingers of the Aroostook and St John Rivers show the achingly beautiful diversity of this northernmost region. The Downeast & Acadia Region is filled with photos of lighthouses, each with their own shape and character. Quiet coves with fishing boats and pleasure craft in places like Bar Harbor and Stonington are also featured. Fiery sunsets, foggy mornings and blue skies with a hint of clouds capture the many moods of Maine’s northeastern tip. The Kennebec Area Photos capture the elegance of Augusta, Maine’s capital city, and the tranquil waterways of the Belgrade Lakes Region. The region’s forests are highlighted in both summer and fall colors. The Kennebec River Bridge and Houston Brook Falls are also featured. Maine’s Western Lakes Region Photos showcase even more of Mother Nature’s handiwork. Highlights include the boldly hued hardwood trees in the White Mountains and the fields of purple and pink lupine found at higher elevations. Even a moose trudging through the snow near Saddleback Mountain was captured by one lucky viewer. MidCoast Maine Photos take you back to the coast, highlighting quaint seaside villages, centuries-old, still working lighthouses and the windjammers docked in Camden Harbor. Lobster boats, some docked at age old piers, other anchored in quiet coves, offer character and a glimpse into Maine’s historic past. Think of it as time travel through a lens. Portland & Casco Bay Area Photos capture Maine’s largest city, a duality of New England civility and natural beauty. Portland’s busy waterfront serves vessels large and small including visiting cruise ships, yet is still home to tranquil areas such as Deering Oaks Park. Lighthouses and windjammers greeting the sunset on Casco Bay are part of this area’s dynamic charm. The Maine Highlands Photo Gallery takes you back into the state’s wild interior. This is the home of Baxter State Park and Mount Katahdin, particularly impressive when covered with snow. Blessed with scenic waterfalls, tranquil lakes and rivers offering whitewater kayak rides, this is Maine for the adventure lover. Bangor, the region’s largest city, offers an entertaining creature-comfort base. The Southern Maine Coast Photo Gallery takes you back to the sea, only this time the Atlantic waves break on miles of white sand beaches. The age old Pier at Orchard Beach makes an appearance, as does the vintage coastal town of Kennebunkport. Sunsets, lighthouses and lobster boats anchored off-shore add their own charm. We’ve also highlighted some of Maine’s most memorable attractions, and the photo gallery just keeps on growing. Acadia National Park Photos highlight remote Sand Beach, the wave-spouting Thunder Hole, mountain meadows filled with purple lupine and the stunning views from Cadillac Mountain. The Maine Bridges Photo Gallery features modern structures like the Penobscot-Narrows Bridge to pedestrian-only covered bridges dating back centuries. The Maine Fall Foliage Photo Gallery highlights the paint-box of colors found each autumn throughout the state. Our Maine Lighthouse Photo Gallery features these sentinels of the sea. Some are perched on rocky outcrops, others on their own little islands, surrounded by constantly churning waters and seabirds surfing the wind currents. Seabirds are part of our Maine Moose & Wildlife Photos, especially the comical red beaked, red footed puffins. Whales and other marine mammals, bears and Maine’s iconic moose are all present. Maine Waterfalls Photos captures some of the state’s hidden surprises, such as Smalls Falls and Houston Brook Falls. Mt. Katahdin & Baxter State Park are so impressive that they have a photo gallery all their own. Take in a moonrise over Mt. Katahdin, Mr. Moose munching away on a tranquil lake, a challenging whitewater stretch of the Penobscot River and much more. Maine Vacations is always looking for new photos to add to our gallery collections. Share your best Maine vacation photos with viewers from around the globe. Simply send them to us using our “photo submission form.” Include your name, where you live and a short description of the photo so we can give you an online credit. Submissions from Maine residents and business owners are also welcome. To be included in our galleries, photos must use good composition, appropriate lighting and otherwise be of very high quality. We look forward to seeing what surprises you have in store!